Such an odd film, for 2/3rd's it's a fairly solid thriller. Mysterious figure inserts himself into family setting, all is not what it seems and to be honest it's fairly enjoyable. The last third though is absolutely all over the shop, the film suddenly isn't sure if it's 'The Terminator', 'Jason Bourne' or some dodgy B flick horror and some of the acting just jarringly in scenes is so absurd you nearly burst out laughing. Are they taking this seriously or are some of the actors just taking the piss at points?! I'd put off watching this as I wasn't really interested in the pitch. Mistake. It's great. Although tonally all over the place and getting progressively sillier, it's well acted, well written and it works. Highly recommended. One part black comedy, two parts thriller. This movie was great. It took its time but didn't waste any time, remained mostly ambiguous and didn't spoon-feed the audience. The acting was great too. It was funny, thrilling, and clever enough not to be bogged down by tropes and cliches the whole time. Also short and sweet. The only good thing about this film is the soundtrack. Horrible script. Terrible acting. Nonsensical, idiotic plot. Bland cinematography. Laughable action sequences. 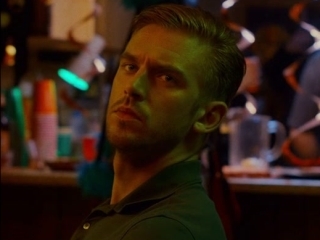 Also annoying is the fact that David (Dan Stevens) is a poor attempt at Ryan Gosling's character in Drive; everything from his appearance to his mannerisms. Terrible film. Even the short 99 minute run-time felt excruciating. Dan Stevens steals the show in this violent-yet-smart thriller full of self awareness and enough suspense, as well as a surprising amount of well performed action to maintain a general interest, mostly thanks to Adam Wingard's stylish direction and a small-but-effective script, all mixed with a pleasant retro-vibe and the strangely use of typical clichés that'll benefit the film's general focus and tone, delivering another fine entry in the director's filmography. A mysterious and creative movie which full of surprise. Recommended! Take The Terminator, mix it with some Drive and sprinkle in a little bit of Psycho, and you have the tense thriller that is The Guest. Dan Stevens plays a discharged soldier (David) who arrives on the doorstep of his fallen friends family. Having promised that he would look in on them, he finds they aren't dealing well with the death of their son. Mrs. Peterson's distraught, Mr. Peterson is drinking and frustrated at work, the little brother has bullies, and the sister is coping in her own way. After agreeing to stay for a little while, at Mrs. Peterson's insistence, David's calm and charming demeanor starts to have an effect on the family. All seems to be looking up until strange things start happening. How well do the Petersons know who is staying in their house? This movie is so stylistically fun, and I have no interest in giving anything away. I watched this movie knowing literally nothing about it other than the genre, and I'm so happy that's I got it see it. I understand that doesn't make for a great review, but I will say, Dan Stevens is commanding on screen, I don't think I've seen anything else from him but I understand why he has been cast as The Beast in the Disney live-action remake of Beauty and the Beast. Highly recommend this for those of you who like the feeling of hair standing up on the back of your neck. A slasher horror with a touch of comedy! Really enjoyed every moment of it! A horror flick mixed with the pace of a thriller and just a pinch of slasher gore make this low-budget movie a great watch! The emperor has no clothes moment....I'm not sure if people are reviewing the right movie because this is one of the worst movies I've ever seen. Terrible acting, terrible directing, a few hours of my life I will never get back. Good movie with an unexpected ending. Adam Wingard's slow-burning thriller is bold, brutal and demented, thriving with dark and violent thrills, an investing script, beautiful cinematography, incredible music, and a stunning, yet piercing performance from Dan Stevens. Nothing new here, so the 89% score is really weird. I guess the critics really wanted to like this movie (or least its director, since half of them mention what a hot talent he is). But there's very little here that's impressive in any way. The star performance is good. Everyone else is decent. It's watchable. But don't sit there waiting for this movie to take off. It never does. Wingard follows You're Next with another atmospheric film that doesn't hold back. Stevens is the central and brooding figure who is either not what he seems or a twisted psychopath. The films strengths are the visual and music beats, Wingard nails both in what would be an otherwise boring affair in another filmmakers hands. The film has that uncomfortable balance of keeping you on the edge of the seat while also hoping Stevens character doesn't die, such a fine balance in a film of this nature. This won't appeal to everyone but this a very strong cult film that deserves an audience. 07-02-2017. A very predictable movie with a terrible ending. The plot isn't unique, re a guest misrepresenting his intentions. The acting is ok, but nothing special. There's nothing about this movie that truly stands out or makes you say "Wow". Piccolo e sottovalutato film dalla trama interessante, ricca di colpi di scene e cambiamenti inaspettati. Il punto di forza del film è sicuramente l'attore protagonista, interpretato e diretto alla perfezione, riesce perfettamente nell'intento di trasmettere ansia e tensione lungo tutta la durata del film. Il perfetto bilanciamento dei personaggi ed una sceneggiatura funzionale, concreta e ridotta all'osso rendono il ritmo della pellicola molto vivace e mai noioso. Le scene d'azione non saranno le migliori che io abbia mai visto, ma per quello che devono trasmettere funzionano in modo discreto. Nel complesso si tratta di un buon film che eleva il potenziale di un regista in costante crescita.